More floor space has been added to the Touch of Class, making it possible to display more items. opened for business on April 10. The goal is to sort donated items and get them on the racks much quicker with this additional space. Hall said more racks are coming to display children’s toys on. Kassie Scott of Farmington said she comes to the Touch of Class pretty often. “The new addition is really nice, especially the floor,” she said while looking over the many items on display in the addition. Touch of Class is open Fridays from 10 a.m. to 6 p.m. It is open from 10 a.m. to 5 p.m. the other six days of the week. 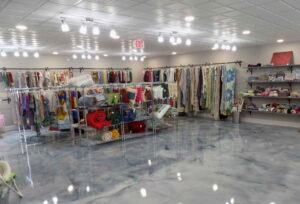 Touch of Class is one of three thrift shops operated by Work First Inc., a private nonprofit organization that offers services to individuals with intellectual disabilities. 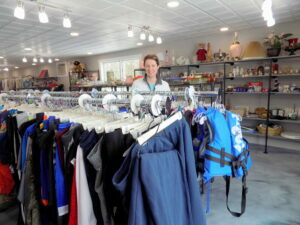 The three thrift shops, two in Farmington and one in Jay, offer paid employment for some of those individuals. Thrift stores are trendy now. They offer good quality clothing and other items at reduced prices, reduce environmental impacts and can be a source for unique finds. Work First is always looking for high quality donations for their shops. Only clothing and very small household items are needed. Bins are located outside the Wilton Road shop and in the Jay Plaza for the community’s convenience. For more information, call Work First at 778-3200. Farmington Maine, Work FIrst Inc.